Here's the thing you already know about this space. If you're not consistently evolving, growing, learning and experimenting, than you might as well go work in another industry. In the spirit if everything I just said—I've launched a new pet project called "Brand U.0". It's not a blog (well, this link will take you to one). But it's an idea. Personal brands matter—we're creating them each time we create a profile online, reinforcing them each time we have an interaction and if we get fired or move on in our careers—it's the one thing we are allowed to take with us. That can never be taken away. And consider this. Successful personal brands are REALLY HARD to build and maintain. And that's why there are so few examples of people who have cultivated huge followings and actually live up to the brand they have built. 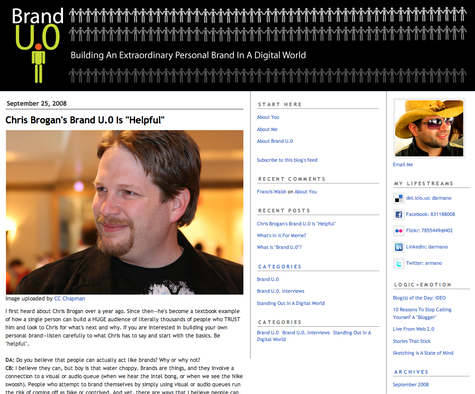 Chris Brogan is one of these people, and he's my first interview . Join me in this experiment—you never know where it will end up. The thing I Iove about the Web is that it levels the playing field. Novices and professionals each have equal shots at being heard. So when a company like IDEO launches official blogs (later in the game compared to many), it really doesn't matter because the Web thrives on quality of content and interactions. Everyone has a chance. "IDEO Labs is a place where we can show bits of what we're working on, talk about prototyping, and share our excitement over the tools that help us create." While IDEO Labs is not posting in large volumes, it does offer some behind-the-scenes glimpses into their process and how they work. Check out this video of an IDEO team as they play around with their own multi-touch experiments. 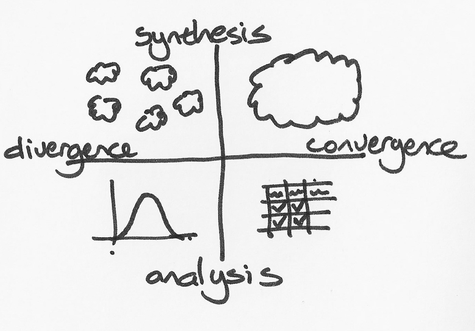 "This is a blog about design thinking. I am in the process of writing a book on the subject and this is the place I would like to share ideas and have a discussion. If you want to get an overview on how I see design thinking then check out the article I wrote for Harvard Business Review here. As you will see as you read the posts, I have lots of questions. If you can help me with any answers or perspectives I would be very grateful. If you let me know who you are I will also do my best to acknowledge anything that makes it into the book." Both blogs support comments, and both are worth checking out. IDEO are master marketers and intelligent self-promoters. In addition to learning about design methods and thinking, you might learn something about how to market your own organization from them. 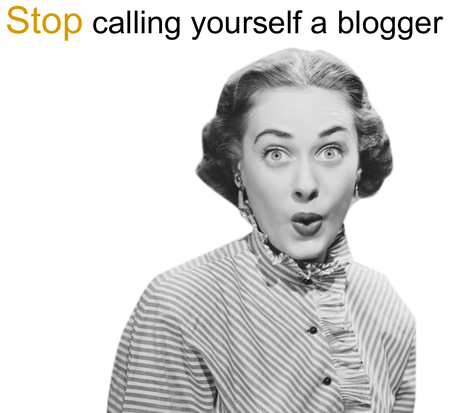 10 Reasons To Stop Calling Yourself A "Blogger"
1. People are only nice to bloggers because now, they have to be. 2. Blogger sounds like "booger". Ew. 3. Bloggers are so 2006. "Microbloggers" are the new bloggers. 4, Most successful bloggers have written a book. That makes you an author. 5. If you haven't written a book, you're just a blogger. 6. 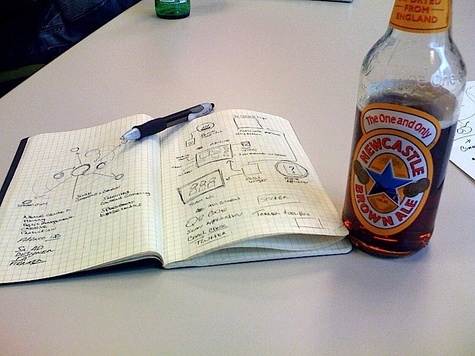 No one really wants you to blog about what they did at last night's party. 7. Blondes have more fun. Bloggers have more fights. 8. Bloggers are now respectable, like journalists and lawyers. Except no one trusts journalists and lawyers. 9. The word blogger rhymes with "jogger"—subliminally recalling images of head bands, knee highs and short shorts. 10. Bloggers only talk about blogging. You're more interesting than that. I'm attending and speakiing at the Web 2.0 Expo in New York. I'll write about it later, but for now here's a quick podcast I did with the folks from Blogtalk Radio. What's a story? There are so many definitions that I won't even try to define it here. 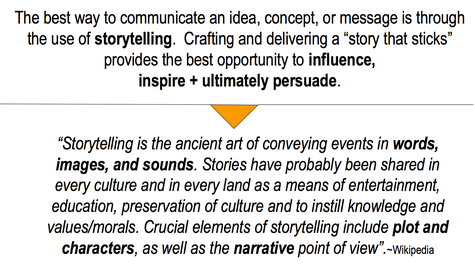 But I do know one thing—good communicators are good storytellers, and good storytelling is memorable. I'm still fairly new to public speaking and so I try to weave in short stories to my presentations mainly because I can't present something effectively unless I can relate a personal story to it. A story that means something to me. It's why I brought Randy Paush into my micro-interactions presentation. It's why, when I'll talk about "personal brands"—I'll probably pepper it with stories I've heard before or maybe something I've experienced myself. Being an effective storyteller isn't easy—but it's much easier to tell a story that matters to you. Stories that stick can influence decisions, inspire people to take action and persuade people to see things in a different light. Next week I'll have two opportunities to tell a story. Hopefully, they stick. "The hallmark of any great brand is authenticity -- just ask Harley-Davidson, Coke or Apple, especially when all of these brands lost their way and learned from it. Same thing applies to Brand You. In every tweak or a template, upload and keystroke, you have an opportunity to be authentic or disingenuous. Know what makes you special and unique, and tap into those qualities as you build your personal brand online. Most people can spot a fake when they see one, so remember that being genuine is more important that presenting yourself in an artificially glossy manner. It used to be important for bloggers to "find their voice" -- now it's relevant to all of us. These are a few things to consider, and you don't have to be Robert Scoble or Seth Godin to benefit from them." I think personal branding is a behavior we'll see for quite some time. Just take a look at how much time is being spent by kids on their own profiles—and of course, you don't have to be a kid to have your very own "brand" online. If you are attending the event, be sure to say "hello". Russ Unger recently had a chat with me over at Boxes and Arrows. Russ asked me a bunch of questions, but I though this one specifically was relevant as it pertains to my upcoming talk at IDEA 2008.